Take a look. Can you find me? I know what you’re thinking. Oh, he’s just saying that, because there’s no way to prove that he’s not actually behind the giant, life-sized head of LeBron James. He could just as easily tell us that Abraham Lincoln’s sitting next to him (a noted NBA fan), or this year’s Little League world-champion team. How would we know he’s being honest with us? To all the doubters out there, let me say this. Maybe I can’t prove my physical presence in Miami’s American Airlines arena, but this is indisputable. If I do go to a game, and if there’s one crazed fanatic out of the 16,000 other ticketholders who somehow manages to bring in a six-foot cardboard cut-out of the head of his favorite athlete, and then proceeds to raise it high in the air throughout the game as a demonstration of his unsurpassed loyalty, immense creativity and tremendous stamina, I’ll be the one sitting exactly two rows behind him. I think back to the time before stadium seating in movie theaters. I remember getting there early, the only time I was early for anything, to get the best seat. Sometimes I’d get lucky and the seat in front of me would stay empty, even though the theater was filling up. I remember the increasing anxiety as the minutes to curtain would tick down, and I would try to rush them along with all the mindpower at my disposal, praying to reach the increased safety of a darkened theater. The lights were just about to dim, I could feel it, and I would get so excited I could barely restrain myself. I was on the verge of having the whole movie screen to myself for once. And then, at the last second, some watermelon-headed dude would spot that seat in front of me, and instantly cause a total eclipse of the cinema. Except I would never do that. Because I’m that guy. Or the time in high school, at the spring sports assembly, when the tackle from the football team with the thyroid condition sat on the bleacher in front of me. Unable to see anything that was happening down on the floor of the gymnasium, I had to piece together fragments from the sporadic glimpses through rows of heads whenever he would lean over to punch a friend in the shoulder, or make kissing noises at horrified girls. The same glandular case who was somehow quick enough, when the pep squad decided to launch Frisbees into the stands, to duck out of the way at the last second, but because I, having nothing better to do than count the number of lights in the scoreboard, never saw it coming, I took the hard plastic disc to my face, causing momentary blindness and an instant nosebleed that my classmates found hysterically funny. 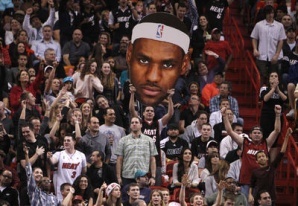 So, yes, I was there, in Miami, feeling the pain of those poor souls blotted out of the game by LeBron’s enormous head. No matter where it is, or when; I’ll always be there. I’ll be all around in the dark. I’ll be everywhere. Wherever you can’t look, because some jerk wants to draw attention to himself by holding up a sign that can be seen by orbiting telescopes, I’ll be there. Wherever there’s a cop, not beatin’ up a guy who wears a rainbow wig and insists on standing on his chair, even when people have politely asked him to sit down. I’ll be there. I’ll be in the way guys mumble to themselves when a woman with a Jiffy-Pop hairdo sits in front of them, mauling their sightline. I’ll be in the way a kid sighs with resignation whenever an adult thoughtlessly stops in front of them, obliterating their view of a parade, or a race, or a woman flashing her breasts from a balcony during Mardis Gras, I’ll be there, too. Note: If you're interested, here's a link to the original, unaltered version of Tom Joad's speech. Extra Note: By the way, the rest of the book ain't so bad, neither. You think you have it bad, I'd be the one blocked by your red arrow! Right, because you'd undoubtedly be sitting next to me! Or, if the row wasn't full, one more seat over, in accordance with accepted heterosexual male friend SOPs. Metrocenter Mall or Home Sweet Home?